This is one of the problems I got via a friend who recently faced a company called Sahaj Software a clone company to Thoughtworks. A very prestigious chain of Hotels is facing a problem managing their electronic equipments. 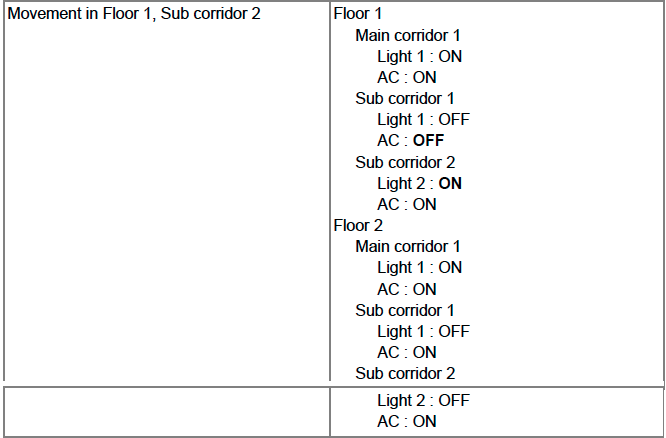 Their equipments, like lights, ACs, etc are currently controlled manually, by the hotel staff, using switches. They want to optimise the usage of Power and also ensure that there is no inconvenience caused to the guests and staff. So the Hotel Management has installed sensors, like Motion Sensors, etc at appropriate places and have approached you to program a Controller which takes inputs from these sensors and controls the various equipments. 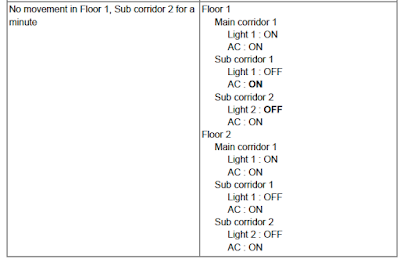 Motion in sub corridors is input to the controller. 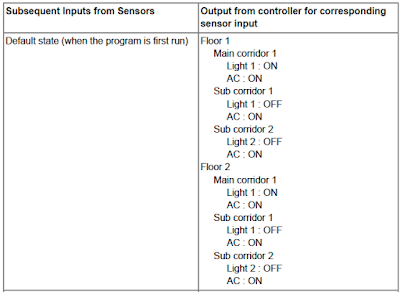 Controller need to keep track and optimise the power consumption. 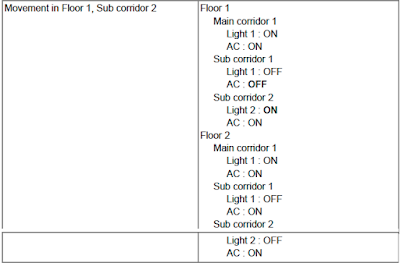 Write a program that takes input values for Floors, Main corridors, Sub corridors and takes different external inputs for motion in sub corridors and for each input prints out the state of all the lights and ACs in the hotel. For simplicity, assume that the controller is operating at the night time. 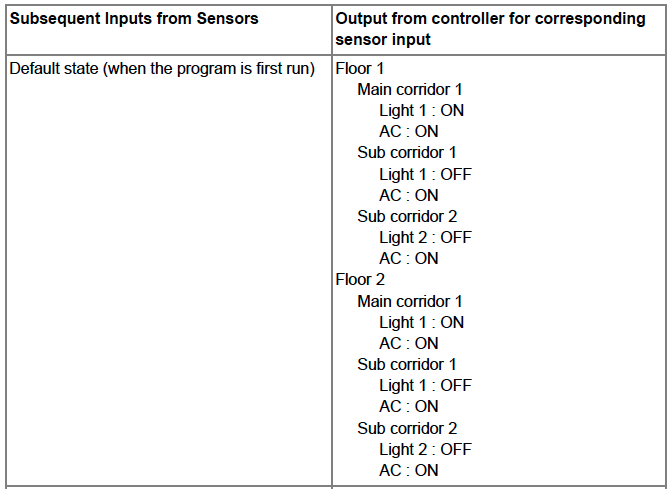 Sample input and output below. 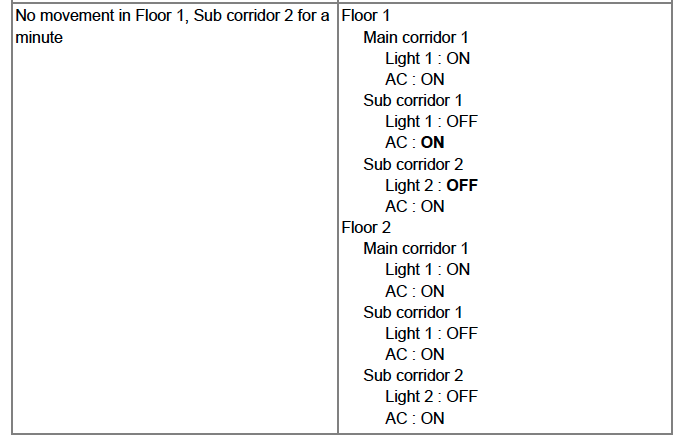 Since the hotel management is trying this for the first time, they would be changing the requirements around which electronic equipments are controlled and the criteria based on which they are controlled, so the solution design should be flexible enough to absorb these requirement changes without significant change to the system. The solution to this problem involves approaching in an object oriented manner. Also we need to see here that we should use a Command/Strategy Pattern given there could be changes in the behavior based on external factors. I have not included the timings from the problem but from on here it should be easily extensible. You should note that this is extremely fast because it executes the command on the VPS - usually EC2 which has amazing internet speeds. And then copies it over scp as a single file. You can also add a compression step using the --format option in the pg_dump. Stand still - and you are going backwards! Imagine you are standing on a moving escalator that is supposed to take you from a Ground level to the Top level - only that its moving in the opposite direction. If you stand still on such an escalator you will hit the bottom soon. In order to not hit the bottom - you need to "at least" walk at the -ve speed of the elevator. For an observer it would still be standing still but thats the least one could do especially being in the software industry. My blog once had crossed a million page views and the most active time I was during 2010. I think looking back - that was the time I had cracked any problems thrown at me. And I enjoyed it. I still could crack em only that I realise recently I've become rusty. However, I developed a variety of different skills down the road. Alright I think I am diverging too much from what I wanted to say. In the IT world, one needs to constantly keep learning, keep pushing the limits, get hands dirty on a variety of technologies. If you are a manual tester - try poking at Automation testing. If you are an Automation Engineer - learn about performance/scalability testing. If you are an application developer - explore system development. If you are a software architect - see what is going on in that particular space and try to remain on top. That is the only way you could make sure that you are always on the 99th percentile in this industry. One has to realise doing the mundane and similar work won't scale as we have already headed and running in the First order differentiation of time (speed). Second order differentiation (acceleration) will make us even more redundant. Can't imagine what we differentiated even one more step. The only way to sustain such challenging epochs is to learn. Learn learn learn! One of the problems I recently faced. Output: Print all the combinations of characters for that given number. There are many ways to solve this problem. One is using a tree. Another way is to simply do it with recursion. I solved this using a linear approach. 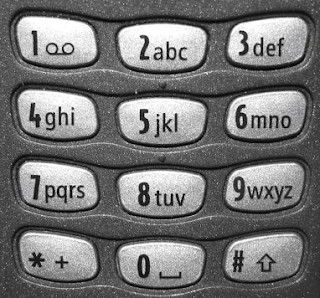 If you convert the problem from the text domain to number domain - it will seem very simple. I primarily work on Ruby on Rails and I use to deploy one of my pet projects to Production entirely on the Heroku's free tier. It was a wonderful two years to see having my application running there during which time I had around a thumping 10 Million page views! Heroku's free tier is one of the most used around the world for quickly showcasing development applications. However, my Production application was such that all my needs felt well under Heroku's free tier. Free Dedicated (techincally not) machine with 512 MB - The reason its technically not because you are allotted a free worker that would go to sleep if the application is not up for 30 minutes. However you could easily overcome this with something like Pingdom. 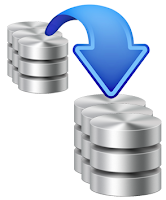 Free Postgres Database - Although there was no specific size limit to this other than a maximum number of 5000 rows, I would still say this is one of the best things Heroku offers. Not only your application can talk to it, anything anywhere from the world can talk to the database directly. And that too 100% free! Free emails via Sendgrid - A maximum 200 emails per day! Sendgrid's free Addon allows me send upto 200 emails per day. My application's requirement was in the range 20-40. Unlimited Job Schedulers - Although they would take one entire and the only worker allotted to you to spin, this is a boon considering you do not have a full fledged linux machine with you. I use to have only one rake task that takes a routine back up of my data as CSV and email it to me. 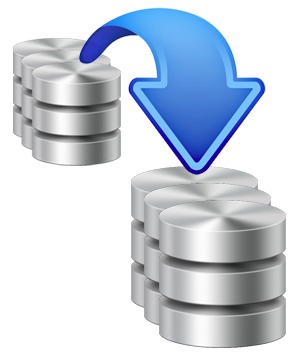 Free PG Backup - Again, if you want to routinely backup your data, you don't have to write any complex code. Heroku provides this out of the box and for free! Sad to depart ways, but you made me learn a lot of stuff in these two + years.